GoMail Group Mailer for Outlook 200X 2.8 - Download Win Apps. Send personalized group email from Microsoft Outlook. Fast mass email engine for your email marketing needs. It can send over 100,000 emails under 5 minutes using up to 150 threads. 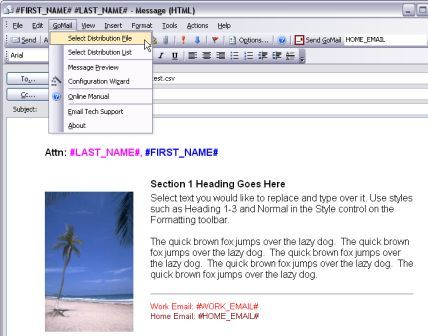 GoMail operates from Microsoft Outlook2000/2002/2003/2007/2010 as an add-on component. It supports HTML or Text with attachments. Use GoMail to send to different mailing list at the same time! Schedule email campaigns for sending later while keeping to the ISP emailing limit. Mailing list management tools included.